Winter Camp Open For Registrations! 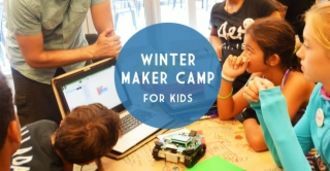 This winter break we’re offering four days of maker fun at our downtown maker space. Participants can either sign up for the full four days and work on a continuous project using a range of skills and tools, or sign up for a single day(s) and work on a smaller project. The camp will run from 9-4pm every day at our downtown maker space and is designed for participants ages 7-14 to imagine, design and build a project of their choice! HOW MUCH: $95 for one day ($115 for robotics day to account for additional materials), or $350 for the full four days.